Not all smartphones come with a built-in front camera flash, and yet good lighting is crucial to creating the perfect selfie. The fix for the above dilemma? A Front flash camera app that can provide simulated camera flashes to better light your selfies. Here are the seven best front flash camera apps of 2019 for your Android and iOS smartphones. Like many of the apps on this list, Selfie Master uses the brightness of your phone's screen to provide a front camera flash light source. The app also allows you to customize its camera, letting you control its brightness, exposure, focus mode, and white balance. Selfie Master is available for ​Android devices and is free to download and use. Selfie Master doesn't seem to have its own direct link to share your photos with various social media apps. But the app should have a direct link to your phone's native photo gallery app. You can share your Selfie Master photos from your gallery app as you normally would any other photo. While taking the photo, you can decrease your selfie's viewfinder/preview in order to use more of your phone's screen brightness to get a bigger flash. The app offers filters, but you can't compare them side by side. Instead, you have to keep tapping the same icon over and over again, and there's no way to toggle back to previously viewed filters. 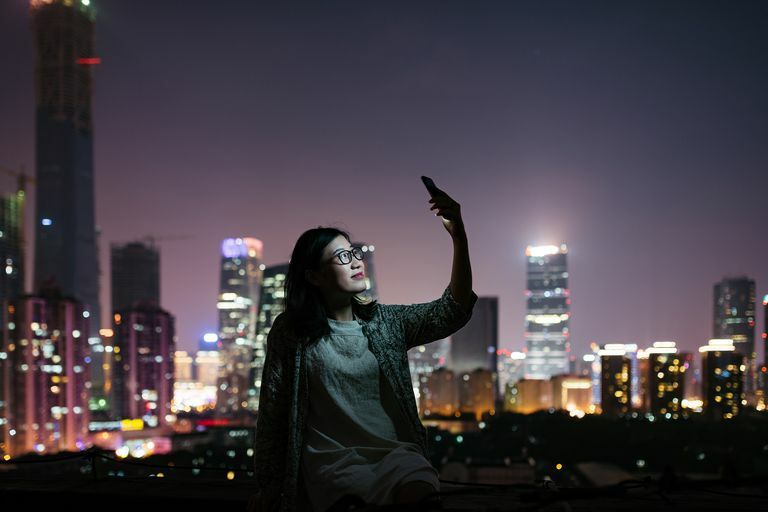 Trying to find the right lighting for night selfies can be a hassle, but the Night Selfie Camera app makes it just a bit easier. Features such as a timer, color effects, and a customizable flash and brightness color are especially helpful. If you're using a selfie stick, having a timer along with your front camera light source can make taking photos with your friends much easier. The customizable flash and brightness color also gives you some variety when it comes to setting up a light source. You can choose from a series of colors ranging from white to yellow to orange. And once you've taken a photo, you can easily share it with your social media apps via its convenient share button. Night Selfie Camera is free to download and use, and is only available for Android devices. Being able to change the color of the flash seems to help enhance the quality of the photos taken. The app is free to use, but the ads that run on it are a bit distracting. Selfie Flash is a front flash camera app that works by displaying an overlay and increasing the phone's screen brightness. It's designed to work with any camera app, including social media apps such as Snapchat and Instagram. Since the app works by using either your phone's native camera app or your social media app of choice, it's easy to share your selfies once you've used Selfie Flash's front flash feature. With the free version of the app, you can adjust the size of the flash, the onscreen position of the flash button, and the amount of time the flash stays on screen. Premium features, such as changing the flash color, or the shape of the flash, are accessed only if you download another app, Selfie Flash Plus, in addition to the free app. Selfie Flash Plus costs $0.99 to download. Selfie Flash is only available on Android devices. It's so easy to position where you want the front flash to occur and being able to do so really optimizes the look of your selfie. The app's front flash overlay shows up easily and is ready to use in other apps. You can't change the flash color or its shape unless you upgrade to the premium version of the app. Selfshot is a front flash camera app that allows you to take selfies and video selfies in low-light situations. It's worth mentioning, however, that it's a very basic app unless you pay separately for other features, such as stickers, filters, frames, and even the ability to record video. Selfshot is currently only available for iOS devices. It seems at one point there was an Android version, but the Google Play Store no longer has a listing for it. The app is free to download and use, but Selfshot's premium features, such as the ability to capture video, the removal of ads, and sticker and filter packs, have individual prices that range from $0.99 to $1.99 each. Selfshot can be used with social media apps, including Snapchat, Instagram and Facebook. Photos can be taken in landscape or portrait mode, which can be helpful for group photos. Features such as the Self-timer and Burst (which is 10 selfies taken rapidly with just a tap) seem like basic features that should be included within the free version. Instead, they cost $1.99 and $0.99, respectively. Lumix is a fun, simple to use front flash camera app that allows you to to take still and video selfies, and has two unique features known as Color Mode and Overlay. Color Mode allows you to change the color of the flash itself to a wide variety of colors so your selfie has a tinge of that color instead of just white light. The Overlay feature allows you to bring Lumix's screen brightness/front camera flash to any other camera app or social media app that allow s you to take selfies. Which means you could take a selfie in Instagram and use Lumix's Overlay to take a brighter, sharper selfie. The Lumix app also allows you to share your selfies directly with your social media apps. However, your video selfies can only be shared from your phone's native photo gallery app, rather than from within Lumix. Lumix is available for Android devices and is free to download and use. Upgrading to the $0.99 Pro version will remove all ads, and give you access to more color options, and the ability to set longer timers and record longer videos. It's easy to toggle through and access all of the app's camera options. Color Mode is a fun way to give a selfie a different mood. While the Color Mode feature seems to work well with still photos, the same mode doesn't seem to show up very well when shooting video. In videos, the colors aren't as intense, and it can be hard to tell if they show up at all. If all you need is a quick-and-dirty selfie light app, then Front Flash may be your best option. It uses your phone's screen brightness to light your selfies, and you can customize the front flash it offers by changing its color to better flatter your skin tone. The app also allows you to share selfies directly with your social media apps. Only available on Android devices, Front Flash is free to download and use. It's easy to use and its front flash feature works as advertised. The photos are significantly brighter. The app sometimes lags when loading certain features. While it can produce well-lit selfies, it can take a while to capture your photo. Be prepared to hold your pose a few seconds longer. Moonlight allows you to take better lit nighttime selfies by letting you adjust the exposure levels while taking a selfie, and the brightness levels of the photo after you've taken it. It's most unique feature, however, is the app's ability to optimize your night selfies by rapidly capturing four photos, combining them into one brighter photo, then using an algorithm to calculate the exposure that will reduce the most grain and noise. Moonlight also includes a self-timer, filters, and the ability to share your photos with social networks like Facebook and Instagram. Moonlight is available for iOS devices and is free to download and use. Its filters are specifically designed to enhance photos taken at night. Not enough extras. It would have been nice to see a collection of stickers or emojis to have a little more fun with photos.